This lemony risotto is both luxurious and light, with a pop of freshness from Italian parsley, and topped with delicate seared scallops. Includes directions to par-cook the risotto ahead of time. Rinse the scallops thoroughly, making sure they are free of sand. Remove any abductor muscles that are still attached to the scallops. Pat the scallops dry with a paper towel and refrigerate. Melt 1 tablespoon butter with oil in heavy large saucepan over medium heat. Add shallots and sauté until tender, about 6 minutes. Add rice; stir 1 minute. Add wine and stir until evaporated, about 30 seconds. Reduce heat to medium-low. Add about 1 1/2 cups of the warm broth and simmer until absorbed, stirring frequently. Add remaining warm broth 1/2 cup at a time, allowing broth to be absorbed before adding more and stirring frequently, about 16 minutes. Remove the rice from the heat. Spread par-cooked risotto in a shallow baking pan and cover. Refrigerate until ready to serve. The rice can be prepared to this point up to 3 days in advance. Remove chilled rice from refrigerator and bring to room temperature. Heat the remaining 1 3/4 cups broth in a large pan over medium-high heat. Reduce heat to medium and add the partially cooked risotto. Stir with a wooden spoon until the broth is absorbed and the rice is done cooking, about 5–10 minutes or until rice is tender but still firm to the bite. Turn off the heat and immediately add the remaining 2 tablespoons butter and Parmesan cheese, stirring vigorously. Stir in parsley, lemon juice, and lemon peel. Add salt and pepper to taste. Heat 1 tablespoon olive oil and 1 tablespoon butter in a large sauté pan over high heat. When the fat just begins to smoke carefully add the scallops making sure they don’t touch each other. Sear the scallops until they form a golden crust, then turn over and do the same on the other side (about 1 1/2 minutes on each side). Do not overcook. 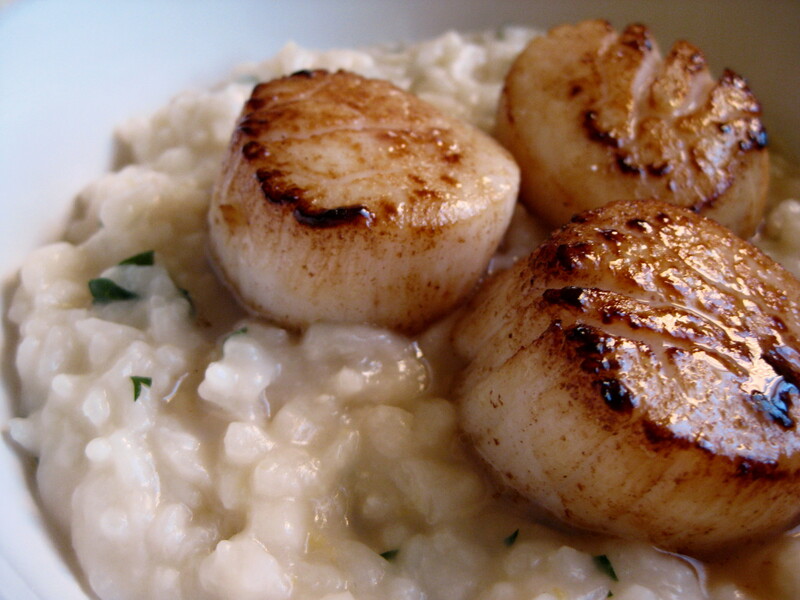 Serve the scallops on top of the risotto.